Expected to launch in second half of 2019. Will be the cheapest CKD offering from Honda for India. Bookings for the bike have started at select Honda Wing World dealerships for Rs 5,000. Will be offered in two colours - Matte Axis Gray Metallic and Candy Chromosphere Red. Honda took everyone by surprise as it confirmed that the CB300R will go on sale in India in 2019. The Japanese two-wheeler giant has confirmed that the new motorcycle will be brought to our shores as a CKD (completely knocked down) unit. This will make the Honda CB300R the lowest displacement offering from Honda to be assembled in India. Honda officials have also added that it will be a made-in-India product which leads us to believe that there will be certain degree of localisation. Most importantly, the bikemaker has also said that the CB300R will be priced under Rs 2.5 lakh (ex-showroom). Customers interested in the new Honda bike can book it for Rs 5,000 at the 22 Honda Wing World dealerships across India. The Honda CB300R was unveiled globally at the 2017 EICMA motorcycle show and is a part of Honda’s ‘Neo Sports Café’ portfolio. Last month Honda had launched the CB1000R, the flagship model in the ‘Neo Sports Cafe’ lineup, at Rs 14.46 lakh. 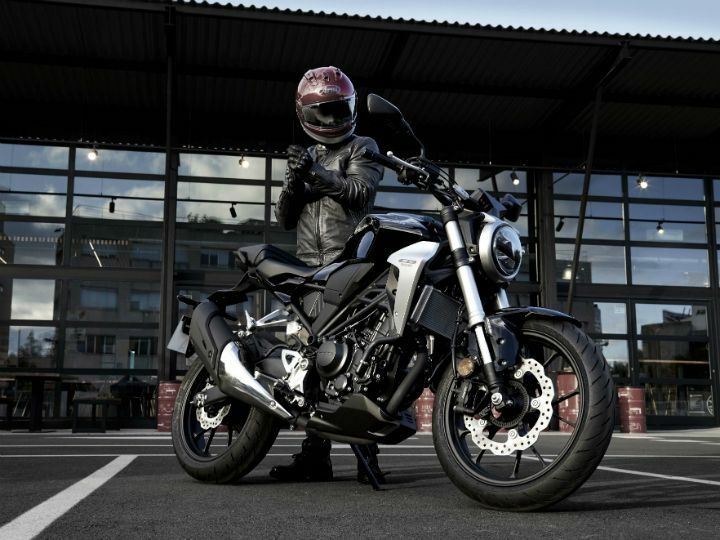 Coming back to the CB300R, the new motorcycle follows the neo-retro styling as seen on the CB1000R with a round headlamp, chiselled fuel tank and a minimalistic tail section. Adding to the aggressive stance of the bike are LED headlights and chunky USD forks. The CB300R features an all-digital LCD instrument cluster which has readouts for speed, engine rpm, fuel level and gear position. Powering the bike is a 286cc DOHC 4-valve liquid-cooled single-cylinder engine churning out 30.9PS of power at 5,500rpm and 27Nm of torque at 7,500rpm. It comes mated to a 6-speed transmission and Honda claims a fuel economy figure of 30.2kmpl. As far as underpinnings are concerned, the CB300R features a tubular steel frame, which is suspended on 41mm USD forks at the front and a preload adjustable monoshock, while the swingarm is a steel-plate unit. Braking is handled by a 296mm front disc with a four-piston caliper and a 220mm disc at the back with a single-piston caliper. Dual-channel ABS will also be on offer. Seat height is relatively low at 779mm and the bike tips the scale at 143kg (kerb weight). While the international-spec CB300R runs on Dunlop tyres, we expect the India-spec bike to get MRF tyres to keep costs in check. A fuel tank capacity of 10 litres will restrict its touring ability. We expect the Honda CB300R to go on sale in India by March and it will compete against the KTM 390 Duke, BMW G 310 R and the Royal Enfield Interceptor 650 (with respect to pricing). Watch this space for more updates.